External and internal sun control for residential and commercial applications. Blackout blinds for boardrooms and home theatres. We specialise in motorised and manual blinds incorporating an extensive range of fabrics. Helioscreen supplies the Australian window furnishing market with all the modern colours and styles in sunscreen, privacy screens and blockouts. All external blinds are powdercoated to your individual request and are designed to suit all applications. Helioscreen, as a major innovator, is intent on consistently sourcing new and improved products that increase the performance and appearance of window furnishings. Our intelligent sun control systems reduce glare, heat and improve the energy efficiency of both domestic and commercial applications. 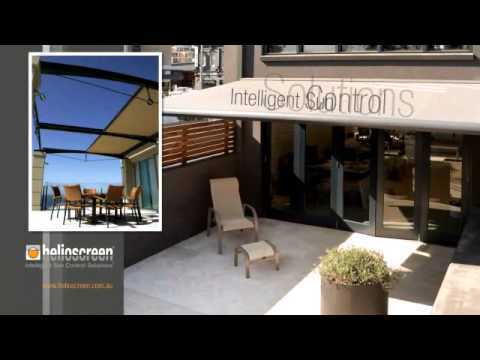 Helioscreen specialises in custom made applications that sets the trend for internal and external sun control in Australasia. We are an Australian independently owned company.